Toyota, bowing to owner reports, issued a safety recall today on 110,000 2000-2003 Tundras sold in 20 cold-weather states and DC to fix frame rust problems that could cause fiery death the spare tire to fall off the truck. Toyota Motor Sales, U.S.A., Inc. will launch a Safety Recall involving approximately 110,000 Tundra vehicles sold in the United States. Certain 2000 through 2003 model year Tundra vehicles operated in cold climate areas with high road salt use, may exhibit excessive corrosion on the frame rear cross- member. In the worst case, the spare tire stowed under the truck bed may become separated from the rear cross member. Spare tire separation will create a road hazard for following vehicles and increase the likelihood of a crash. Eventually, excessive corrosion of the rear cross-member may also affect the functionality of the rear brake line at the proportioning valve. If this occurs, it can lead to the loss of the rear brake circuits which will increase vehicle stopping distances and the risk of a crash. In addition to the District of Columbia, the involved cold climate states with high road salt usage are: Connecticut, Delaware, Illinois, Indiana, Kentucky, Massachusetts, Maryland, Maine, Michigan, Minnesota, New Hampshire, New Jersey, New York, Ohio, Pennsylvania, Rhode Island, Virginia, Vermont, Wisconsin, and West Virginia. If there is no significant corrosion of the rear cross-member assembly or the rear brake line at the proportioning valve, owners will be notified of that fact and requested to subsequently bring their vehicle back to the dealership so that a corrosion-resistant compound can be applied to the rear cross-member. Toyota will notify the owner when the corrosion-resistant compound is available. If significant corrosion is detected such that the rear cross-member can no longer safely support the spare tire and replacement components are available, the cross- member assembly will be replaced. In the event replacement components are not available, a temporary solution, such as the removal of the spare tire and securing it to the truck bed, will be performed until parts are available. 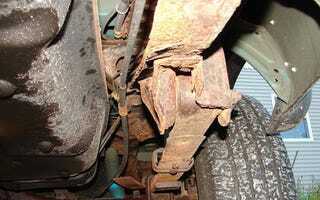 In those relatively rare cases where the rear cross-member is significantly corroded and can no longer safely support the spare tire, but the rear cross-member cannot be replaced due to excessive frame corrosion at the mounting location (e.g., if the side rails are too damaged), Toyota will develop an appropriate remedy for those vehicles on a case-by- case basis. This inspection will take approximately 20 minutes depending on dealer scheduling. Until your vehicle is inspected, you may minimize the risk of the spare tire separating from the rear cross-member by removing it. If you choose to do so, please be sure not to be under the rear cross-member or spare tire carrier during the lowering process. In addition, if placing the spare tire in the truck bed or other area of the vehicle, it should be secured when driving. Customers with questions are asked to call the Toyota Customer Experience Center at 1 800 331-4331.